"The Iron Knees of Life"
I like the lighting. It does create a mood to this photo that the other irons don't have. I like the placement of the iron. The iron came out overexposed and out of focus. The tag adds an unwelcome contrast. Most people don't iron their jeans :) but I won't count it against you. Overall, I give it a 5. Great title, really makes the shot! Also, nice use of B&W. My favorite photo of the challenge. This is a great picture! I love the lighting and the reflection of the iron. Good detail, B/W is good. a groan worthy pun. nicely thought up, and good execution. I like the title. Good play on words. Good light. 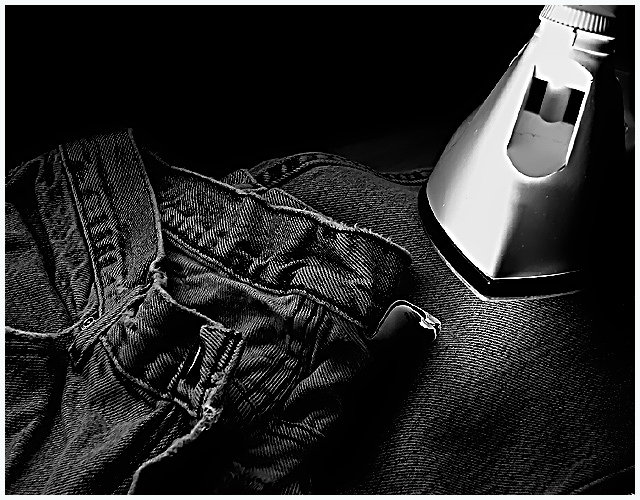 Ya ironing jeans seems to be a bit of an irony, nice textures and shades. That iron reminds me of the Starship Enterprise in orbit around a planet :-) The composition is good, the jeans look awesome in B&W. The iron doesn't really seem to fit in somehow, don't ask me why. The serrated edges on some of the iron's edges are also a little distracting. The best of the iron-knees. Proudly hosted by Sargasso Networks. Current Server Time: 04/19/2019 10:38:29 PM EDT.